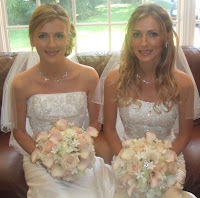 These gorgeous twin brides were married to brothers - yes, that's right bros, but not twin bros. And no, they didn't go on their honeymoon together. But I'm guessing there will definitely be some texting going on. A fresh, flawless and natural look was the order of the day and we achieved it with looks that lasted right to the end of the festivities. Simple elegance and flawless beauty always stands the test of time. It was a very humid day in Toronto so these gals certainly didn't need to be worrying about melting. So I used trusted MAC Face & Body Foundation only where it was needed and sealed it with Audrey Morris Dual Finish Mineral Based Powder. I also use the same dual powder to prime the eyes and by 12:00 midnight their eyes still looked the same with nary a crease. The twins pro mised me at the trial to let their brows grow so we could re shape them at the wedding - and they stuck to their word. In order to shape their brows and also not inflame the skin with too much tweezing, I used the new Sephora brow groomer and simply whisked away what wasn't needed, added a little light taupe eyeshadow with a flat edged angle brush to finish the the symmetry and voila - beautifully framed and natural looking brows. To keep them that way I topped them off with a clear mascara working the brush upward and outward. In order to pop the eyes in a natural way I used individual lash clusters and topped them off with mascara. For a liner I used MAC Fluidline Gel Liner with a very fine liner brush, and then topped it off with a smudge of dark brown shadow to finish the look of strengthening the lash line. I used MAC Nacked Lunch to highlight the inside corners, the middle of the lids and under the brow bone. Careful blending, adding, blending, adding, blending achieved the look. I finished with a dark taupe powdered eyeshadow liner directly under the lower lash line. The twins love bronzer, but strategic placement is the key. First I used a combination of colours in the warm family to give their cheeks a true blush look and then used the bronzing powder across the mid range of their faces and in the center of their foreheads and a slight touch on the chin - that's all - and it was done with a very light hand. For lips I used Maybelline Superstay Lipcolour #785 (a berry shade) and #750 (shimmer pink) as a highlighter in the center of the lower lip to give the 3D lip look. I then used a natural shimmer powder to highlight their collar bones and shoulders and a dusting across the eye. And I used it sparingly so as not to interfere with flash in their photos. All in all, they were as lovely to work with as they were beautiful to look at. It was my sincere pleasure to attend the wedding and to check for touch-ups, but just a light blotting around the nose and a touch of lip gloss was all that was required.